Following its French publication in 1972, Gilles Deleuze and Felix Guattari's Anti-Oedipus received wide attention for its criticisms of the bourgeois family. But most commentaries have focused on the rejection of the nuclear family as an Oedipal configuration. The potential that Deleuze and Guattari's work offers for thinking forms of family beyond the nuclear has rarely been addressed in Deleuze studies, nor has their work been utilised in kinship studies or critical theories of the family. This is perhaps because of assumptions that 1970s feminist critiques and rejections of the bourgeois family are now irrelevant to contemporary debates about politics, economics and subjectivity, which is where most discussions of Anti-Oedipus can be found. However, the social importance of the family does remain a topic firmly on the public agenda, particularly concerning marriage, new reproductive technologies, and the sanctity of the child and childhood. 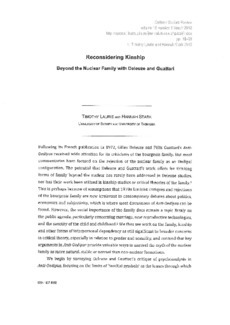 We thus see work on the family, kinship and other forms of interpersonal dependency as still significant to broader concerns in critical theory, especially in relation to gender and sexuality, and contend that key arguments in Anti-Oedipus provide valuable ways to unravel the myth of the nuclear family as more natural, stable or normal than non-nuclear formations.